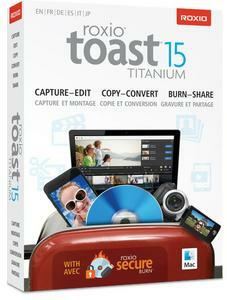 Roxio Toast 15 Titanium, the leading DVD burner for Mac, makes burning even better, adding Roxio Secure Burn to protect your files on disc and USB in Mac- or Windows-compatible formats. Get more style with more than 20 themed templates with menus, submenus, and chapters in Toast MyDVD, the pro-quality disc authoring tool. Quickly trim video with just a few clicks in the new Toast Slice simple video editor.